Bugs Bunny | Ty Templeton's ART LAND!! Destined for Greatness Bun Toons! YAY! 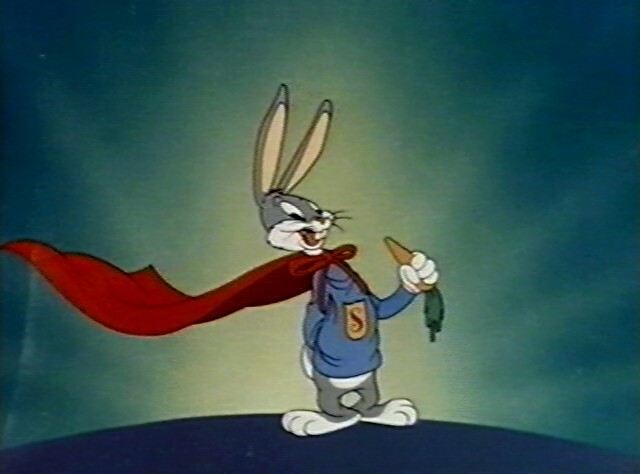 Speaking of “Before they were famous”…You ever wondered how Bugs Bunny got his name? It’s also where the “Looney” part comes from. For the Bun Toon archive, incomplete, but hey, it’s free…click here. The REAL Return of Bun Toons! YAY! YAY! YAY! I’m afraid I have to charge you people a little more for these now, you’ll all be getting my bill. Like MacArthur, I have returned. I’ve returned to creating new issues of Batman ’66. Returned to teaching…. and to whatever motivates me to draw the rabbit. Apparently tomato juice and lemonade is good for chasing that musty smell out of my flesh. It’s hard for me to judge, I have no nose. In this case, Bugs is LITERALLY a stinker. Back to work, now net-peeples. Speaking of…since the Bootcamp classes are starting up again, spread the word for me, okay? We’re running an anatomy class and an inking class starting in a couple of weeks, and would love to see some of you there. For the first “return of Bun Toons” from a couple of weeks ago, ambitious though wrong…click here. 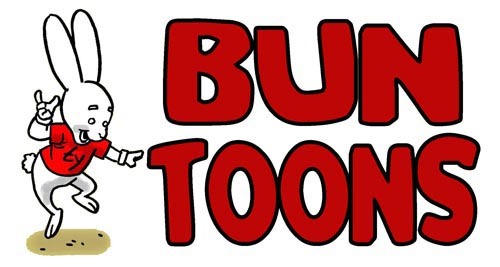 For the Bun Toon Archive, going back years and NOT mentioning heart attacks at all…click here. We’re back with the almost last look at the most and least popular Bun Toons of the year 2011! The #2 most popular sparked quite a bit of controversy in out comments section, where Peter David, Kurt Busiek, Leonard Kirk and a host of others got “into it” with our regulars about the meaning, philosophy and specific point of my little Bunny Funny for the week. Also: racism in America and the comics industry in general was discussed. For a normal post, we might get five or ten comments on a Bun Toon. This one got comments into the hundreds, and sometimes the conversation got nasty. 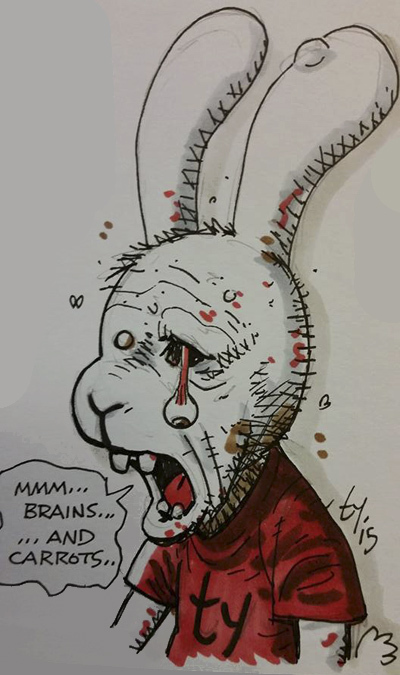 Our Unpopular Bun Toon entry got nasty on panel, with some grim dialogue about killing the Easter Bunny. It was one of my personal favourites for the year actually, but it didn’t get much of an audience when it went up on Easter Sunday. Is the Easter Bunny a religious icon? Is it sacrilege to mess with him now? 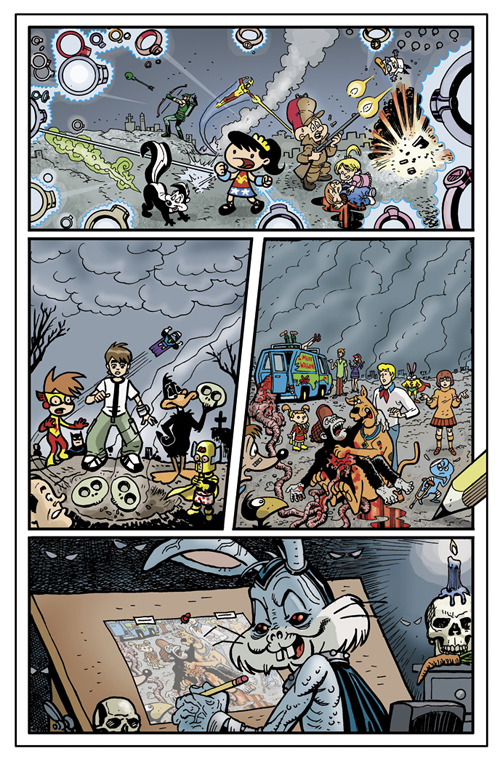 It’s equally possible the Easter Bunny/Comic Book Bonus moment is what frightened people off that day…. It sure scared the hell out of me. See you tomorrow, with the final entry of 2011, the top rated Bun Toon of 2011, and one of my favourite failures. Eggs! Chocolate! Religion! It’s like Christmas, only with more cholesterol. But there’s only room for one king of the cartoon bunnies around here. And I play for keeps. Of course Bugs wins. I was foolish to face him. The rabbit's eyes! They burn into my soul! THEY BURN!! BIG ANNOUNCEMENT: I’ve been made an “Editor Em-hare-itus” at DC. Now it can be revealed. I'm leaving this one as it is. You don't mess with perfection. 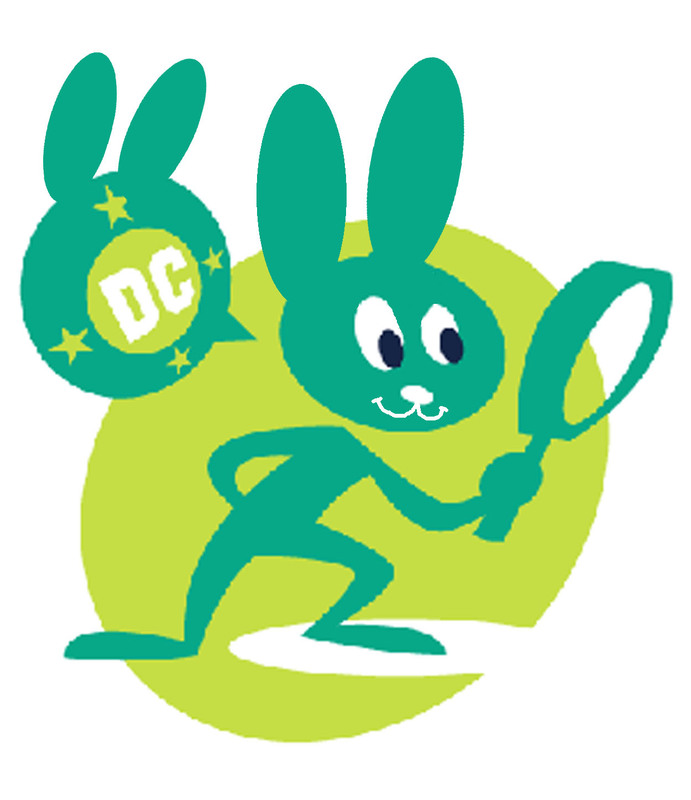 news under wraps for the last few weeks, while we ironed out the specifics, but now that it’s finally April 1st, I can announce that I’ve been offered (and have happily accepted) a job editing a new line of comics for DC called “The Hare Line”. I hope the whole thing isn’t an elaborate joke about me being bald. But I’ve looked at the contracts and it seems legit. It’s a line of comics for kids that feature FUNNY ANIMALS as the lead characters, in an attempt to get readers into comics at the age of five or six, when they tend to be wary of stories about actual human beings. Hoppy the Marvel Bunny. Now a GLBT character, in an attempt to teach tolerance. 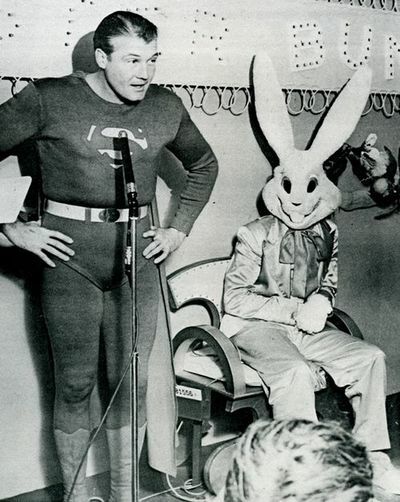 Super-Rabbit will be traveling the world, learning to tolerate the locals and their odd religious beliefs. As a lifelong DC fanatic who has spent much of his freelance career there, and a huge fan of some of their more prominent funny animal characters, I think this is going to be my most fun gig in years. I’ve been given quite a bit of free reign to create new characters and revive old ones, and I’m looking for strong ideas as I settle into the job. It’s more than just a chance to launch new DC titles, this is a chance to shape young minds, and teach life lessons in each title. Perhaps making a gay friendly rabbit book, or a comic that teaches vegetarianism as a legitimate lifestyle choice. 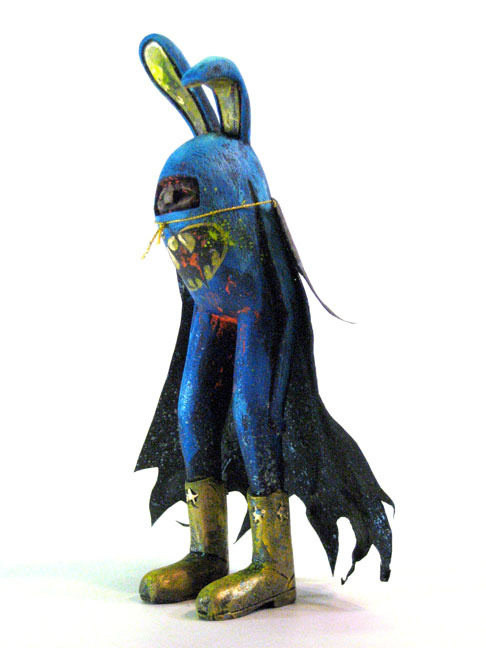 Submitted by a fan, our first "BAT-HARE" pitch isn't doing it for me. As I said, I’m looking for input from regular readers of this blog to help me choose who I should go with for the first wave of books. 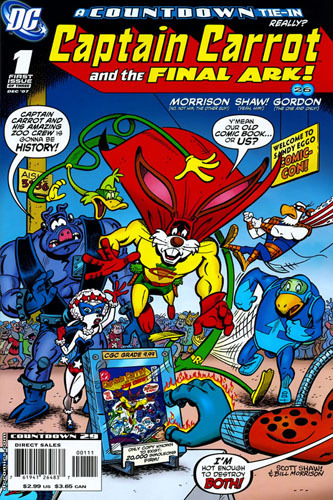 I’m leaning towards a line-up featuring HOPPY THE SIMPLY MARVELOUS BUNNY, CAPTAIN CARROT, SUPER-RABBIT: The TOLERATING FRIEND, and some sort of Bat-Hare title, but I haven’t “found” it yet. Oh, and I’ll spend a couple of dollars suing THUNDER BUNNY out of existence. 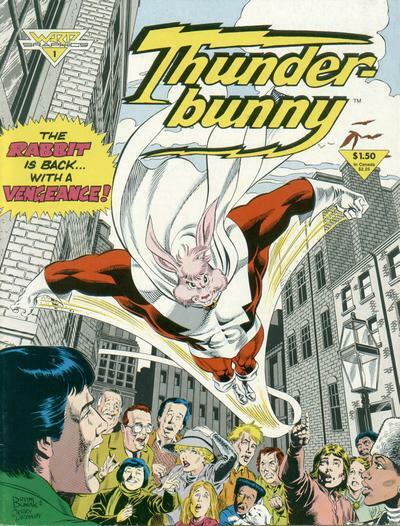 I know it hasn’t been published in years, but it skirted so close to the trademarks on HOPPY, THE MARVEL BUNNY, that I’ve wanted to put it to THUNDER BUNNY creator, Martin Greim since I first saw the title back in the Eighties. I'm digging up this long dead series and putting a stop to it, once and for all. Can’t wait to get started…I’ll keep you posted as we settle on the first wave of titles! I certainly hope this editor-ship lasts longer than just the 1st of April.